Commuters wait in the snow at a bus stop near 12th and Market streets in Center City Philadelphia on Dec. 15, 2017. The City of Philadelphia has declared a snow emergency to take effect at 8 a.m. Wednesday, which requires all parked cars to be moved off snow emergency routes so that plows can clear the city's major thoroughfares. The Philadelphia Parking Authority is discounted, $5 parking at Center City garages through the end of the snow emergency. Those entering the garage after that time will pay normal rates. Beginning at 8 a.m. Wednesday, the PPA will halt enforcement of meters, kiosks and time limit violations. But it will enforce all snow emergency and safety violations. Snow emergency information can be found at here; and a map of Snow Emergency routes can be found here. Cars left on snow emergency routes will be moved to other parking spots to assist in snow plowing operations. If your car is moved, call 215-686-SNOW to find it. Do NOT call 911. In anticipation of the storm, all Philadelphia public and archdiocesan schools are closed Wednesday. The archdiocese noted that its high schools and parochial elementary schools in the suburban counties typically follow the decision of their local public school district and submit an independent closure status. After-school activities are also canceled. Hundreds of schools are closed Wednesday in the four suburban counties and South Jersey. School closings and delays can be found at Fox29.com. The following colleges and universities are among those that have canceled classes on Wednesday: the University of Pennsylvania, Temple University, Villanova University, Rutgers University – Camden, St. Joseph's University, La Salle University, West Chester University and Bryn Mawr College. There will be no trash and recycling collection in the city on Wednesday, officials announced. Residents are asked to hold their trash and recycling until Thursday. Thursday and Friday collections will be delayed by one day. All Philadelphia government offices are closed Wednesday. All courts and government offices are closed Wednesday in Bucks, Chester, Delaware and Montgomery counties. In South Jersey, all Camden County offices are closed for non-essential employees. The Camden County Prosecutor's Office will be closed. SEPTA, which is urging customers to avoid unnecessary travel, has released a list of detours, suspensions and delays already set for Wednesday. SEPTA's weather-related updates will be posted online. Regional Rail service will operate on a Saturday schedule, in accordance with its Severe Storm Service Plan. The Wilmington/Newark Line will operate an enhanced Saturday schedule and there will be no Cynwyd Line service. Norristown High Speed Line trains will run every 20 minutes. 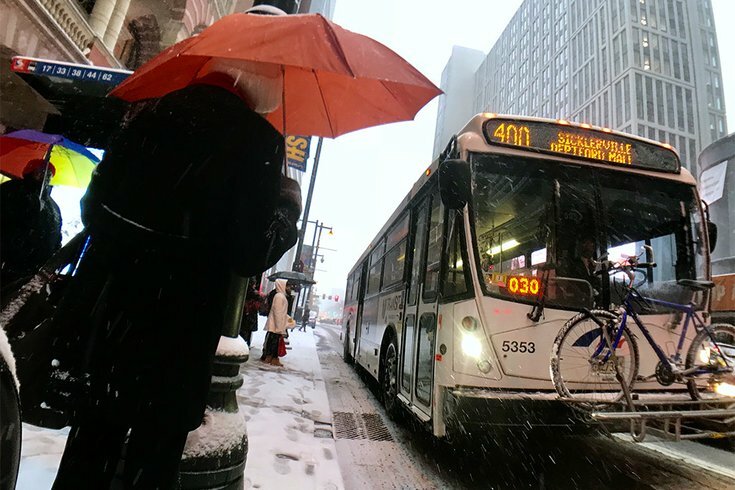 Several city bus routes will be delayed, detoured or suspended starting at 9 a.m. Wednesday. Additional routes may be affected depending on how much snowfalls and other effects of the storm. SEPTA will cut back, and possibly suspend, bus service along routes that are historically impacted by winter storms. This includes the bus routes: 7, 9, 14, 18, 19, 20, 22, 23, 24, 26, 27, 28, 29, 31, 32, 38, 44, 46, 47, 48, 50, 52, 53, 55, 57, 58, 65,70, 73, 77, 84, 88, 92, 94, 95, 97, 99, 103, 107, 108, 112, 114, 117, 119, 120, 124, 126, G, H, XH, J, K, and L.
Additional bus routes could be detoured or suspended if road conditions deteriorate, SEPTA officials said. For travelers who must use SEPTA to get around, the subways will be the best modes of transit, with 24-hour train service operating on the Market-Frankford and Broad Street lines. There will be no Nite Owl bus service. PATCO will modify its train service eastbound and westbound. Its complete snow schedule can be found here. NJ Transit will operate on a Severe Weather Plan Level 1. Complete information here. Amtrak has canceled some Acela Express, Northeast Regional, Keystone Service and Empire Service trains on Wednesday. Details, along with re-accommodation information, can be found here. Philadelphia International Airport advises passengers to check flight status with their airline before coming to the airport wherever you’re flying. Some airlines are offering fee waivers to change itineraries for booked travel to/from certain cities on certain dates in anticipation of the storm. If you're planning to fly over the next couple of days, check with your airline for details. To get flight status, call your airline, get updates at 1-800-PHL-GATE or check the airport website, www.phl.org. The Philadelphia Parking Authority will not enforce meter and time limit violations after 8 a.m. Wednesday due to the snow emergency. The PPA will enforce all snow emergency and safety violations. Vehicles illegally parked on snow emergency routes will be subject to ticketing and towing. PPA will offer discounted parking in Center City garages during the snow emergency to help lessen the amount of cars parked on the street. Beginning at 8 a.m. Wednesday and running through the end of the snow emergency period, a special 24-hour flat rate of $5 is available for the following parking facilities below. The 2018 Philadelphia Flower Show has weathered the storm before. So the show will go on. The Flower Show will be open Wednesday from 10 a.m. to 9 p.m. at the Pennsylvania Convention Center in Center City. This year's theme is "Wonders of Water." The Philly 311 Call Center will remain open during normal business hours Wednesday (8 a.m.- 8 p.m.) to take calls for non-emergencies. Requests for salting and plowing will not be taken during the storm. Once the storm has moved on, the city will announce when such requests will be taken. The Philadelphia Water Department’s customer contact center at 215-685-6300 will be open. Citizens are encouraged to shovel snow from the fronts of fire hydrants and storm drains on their block to allow snow melt to drain to the city sewer system. Philadelphia’s Office of Homeless Services has declared a Code Blue to prevent weather-related deaths among people experiencing homelessness. During a Code Blue, the city’s homeless outreach teams increase staffing and foot patrols throughout the city and transports homeless people directly to shelter 24 hours a day. Also, during a Code Blue, Philadelphia police are authorized to transport homeless people to a shelter. City officials urge concerned citizens who see a person living on the street to call Homeless Outreach at 215-232-1984 and report the sighting. During the call, citizens should provide the address, location, and description of the person in need. Homeless outreach teams are available 24 hours a day, 7 days a week. All Philadelphia prison inmate visits are canceled Wednesday for all jails in Philadelphia County. For updates on Indego bike share during the snowstorm, please refer to the website or follow @rideindego on Twitter. The Departments of Parks and Recreation reminds residents that if a tree falls during a storm and it's blocking a road, or it has fallen on a house, car or other property, call 911. A crew of arborists from the department are on-call to respond to tree emergencies and they will come out to remove the hazard and any part of the tree that is an immediate risk to public safety. Other parts of the tree that don't pose an immediate risk (such as tree trunks and stumps) will be removed at a later time so crews can focus on other safety hazards around the city during extreme weather events. In the event that a tree has fallen on electrical wires, please call PECO's emergency line: 1-800-841-4141. In regards to pet safety, residents should contact the ACCT Philly hotline (267-385-3800) if they observe a dog or other pet outside during extreme cold. It is against city ordinance to leave dogs outside in extreme cold without proper shelter, and owners can be fined up to $500. Stay informed. Sign up for emergency alerts and weather updates from ReadyPhiladelphia at www.phila.gov/ready. For official updates from the City of Philadelphia, follow @PhilaOEM on Twitter or find them on Facebook. Wednesday: Snow before 8 a.m., then rain and snow, possibly mixed with sleet between 8 a.m. and 1 p.m., then snow after 1 p.m. High near 37. East wind 15 to 17 mph becoming northwest in the afternoon. Chance of precipitation is 100 percent. New snow and sleet accumulation of 3 to 5 inches possible. Wednesday night: Snow likely before 9 p.m., then a chance of snow showers till 3 a.m. Cloudy, then gradually becoming partly cloudy, with a low around 32. West wind around 15 mph. Chance of precipitation is 60 percent. New snow accumulation of less than one inch possible. Thursday: Mostly sunny, with a high near 43. West wind 14 to 16 mph. PhillyVoice staff writer John Kopp contributed to this report.